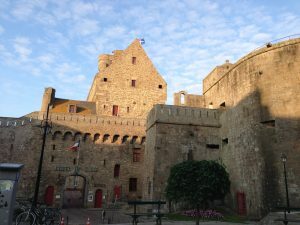 Straddling along the Brittany coast, the walled city of St Malo is often unfairly overlooked as little more than a transit point on to the rest of France. 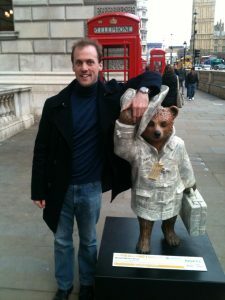 But that does not do justice to the city itself, more than worthy of a few day’s visit. 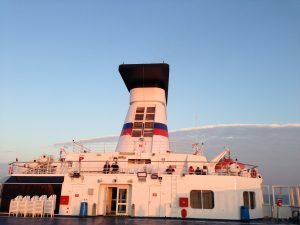 And with a direct ferry from Portsmouth operated daily by Brittany Ferries, its accessibility could not be better. There are many reasons why I think St Malo is worthy of a long weekend trip in its own right. Here is just a selection. Walking along the old city ramparts is the best way to get a view of the many landmarks of St Malo. These walls have a very long history and protect the city adequately from high tides that often occur and provided defence ever since the 12th Century. Circumnavigating the inside and outside of the city, you can see through the streets down below and on a clear day beyond the beach to the forts and islands scattered in the sea. The Fort National (complete with little rock-pools to dip your toes in) is accessible only at low tide. Usually indicated if the flag if flying or not. Part entrance to the five star Hotel de Ville, part entrance to the city ramparts. Further away on a clear day, you can see beyond the Grand Bé and Petit Bé islands and as far as the Fort de la Conchée out in the sea. It goes without saying that walking a full circuit of the ramparts is always by far and away the best possible way to make the most of your visit. The granite buildings that define St. Malo’s main city tower above you. Some of which suffered severe damage during WW2 but have been carefully rebuilt since. La Grand’Porte is the location to start your route. These two giant towers with staircase entrances on either side to this day serve as the entrance to the walled city, both the inside and the outer ramparts. 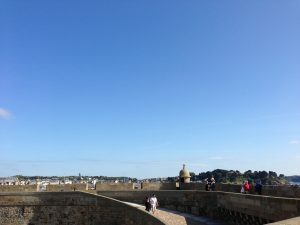 Nothing beats walking along the ramparts of St Malo and bright blue skies. 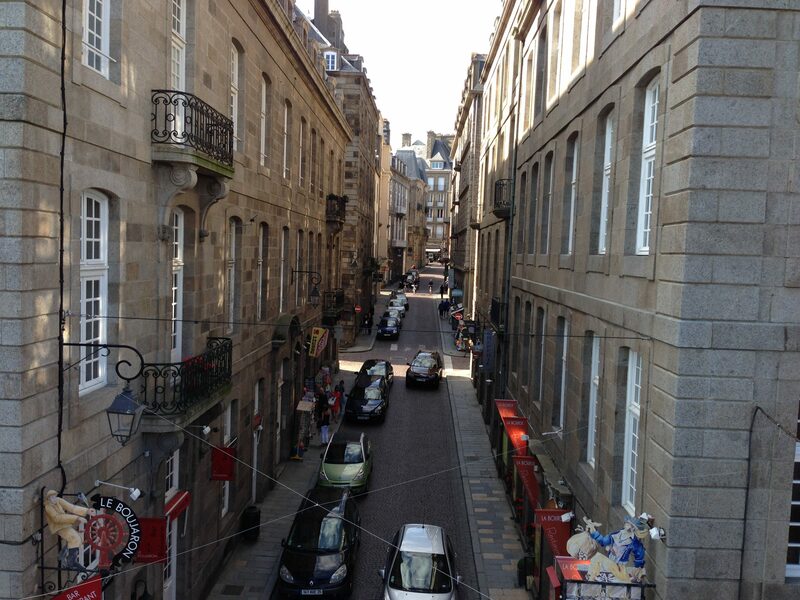 Inside the walls of St Malo itself is a typically charming maze of streets maintaining their old world character. This is the location of many fine cafes, bars and restaurants as well as many top class souvenir shop inside the granite buildings. No visit here is ever complete without a sample of the oysters for which this region is so revered. Either a small plate or a bucket full, different quantities are on offer. St Malo is the location for the Grand Aquarium Saint Malo, a perfect place for families to spend a day. View thousands of different types of fish and come as close as you can to a shark tank! 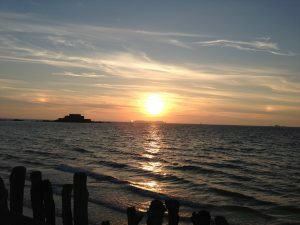 In good view of St Malo are the tidal islands of the Grand Bé and Petit Bé. The former can indeed be reached at low tide via the main beach, Plage du Bon-Secours. It is most notable as the burial ground of celebrated local writer Chateaubriand. The latter is also open at a low tide (which can be quite rare). 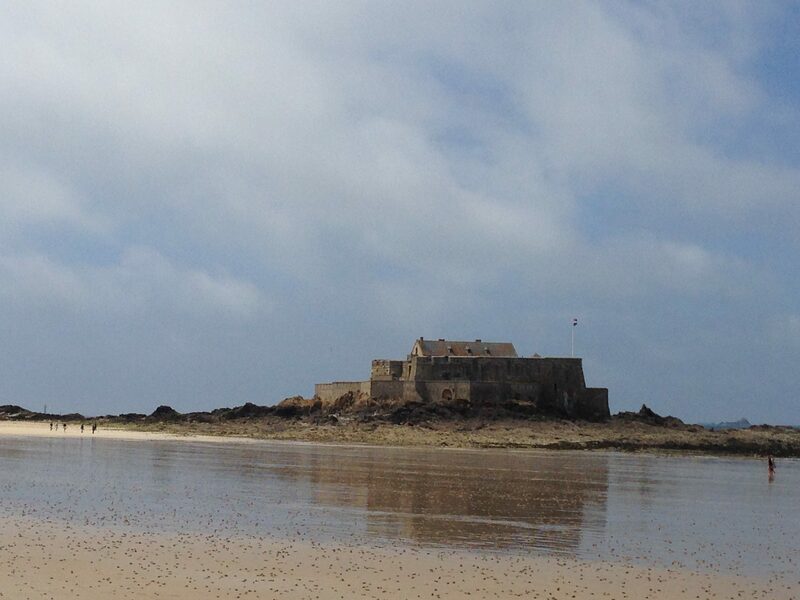 This defence fortress commissioned by Louis XIV to keep the British forces out now sits isolated when the tide is in. On the other side and a little closer to the mainland is the Fort National. Built to protect the city in 1689, it has survived conflicts up to and including the Second World War. Now it is accessible to the public where you can view the underground ammunition storage. Because of the strong tidal presence in St Malo, the Fort is not open all year round. Only between the 1st June and 30th September as well as the Easter fortnight is it open and even during those periods there is no guarantee. Frustratingly when I visited (June 2015), the three days I was in St Malo coincided with a rather high tide thus ruling out a chance to set foot. When the tricolor of France is flying on the fort, that is a sign that it is open for visitors so look out for that. But public access can be fickle. Truth be told it is a matter of pot luck. This is how the Fort National looks on a day when you can walk to it. Spot the islands and islets in the sunset. From left to right – Fort National, Grand Be, Petit Be and further away is the Fort de la Conchee. And what could be better than waking up to a view like this? As the gateway to Brittany and the rest of France, St Malo is in an ideal location for many a great day trip. Dinan, is one of the most well preserved Medieval towns you will find. Half-timbered houses dominate over the cobbled streets that feel like you have stepped back in time. The similarly named Dinard on the coast has always been seen as one of the continent’s most upmarket seaside towns. The “Cannes of the North” has attracted many famous names from the world of film and the arts and maintains several clean beaches. 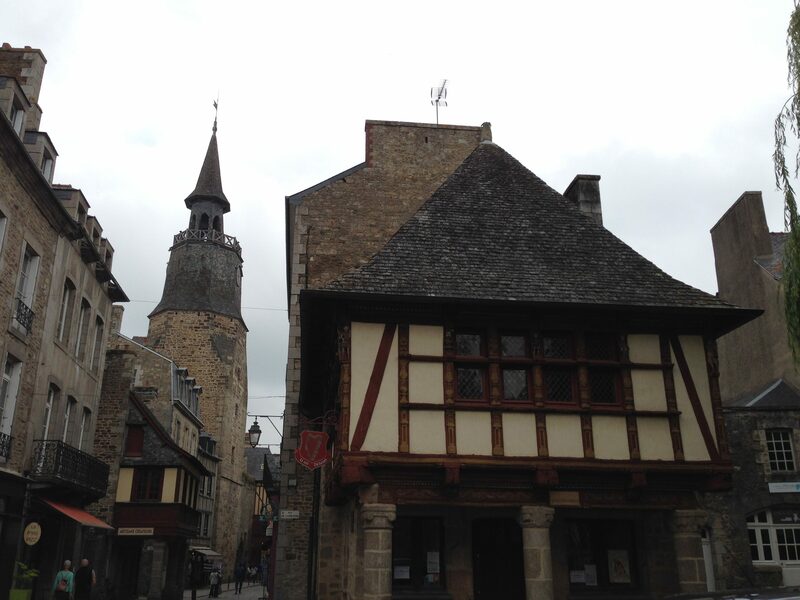 Travel back in time to the Middle Ages when in Dinan, and don’t forget to have a crêpe! Less than an hour away is the island abbey of Mont St Michel. From a distance, this iconic landmark almost resembles the stuff of legend, like something from Lord of the Rings. The towering spire that dominates the skyline, visible from so many miles away has lured pilgrims for centuries. Once upon a time it served as an active monastery. Today it attracts more than 3 million visitors annually drawn to its old world charm. As you know, a direct ferry operates from Portsmouth. Why not combine a trip to St. Malo with a day in Pompey in advance? Learn about the city’s important role in the British naval history, go on board Nelson’s HMS Victory and also the HMS Warrior, visit the impressively renovated Mary Rose Museum and get a view from the top of the city’s modern landmark Spinnaker Tower. 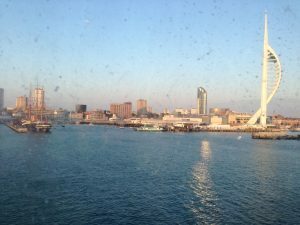 The Spinnaker Tower and HMS Victory are a few of the sights to see in Portsmouth. Excuse the blurry image taken from the ferry window!